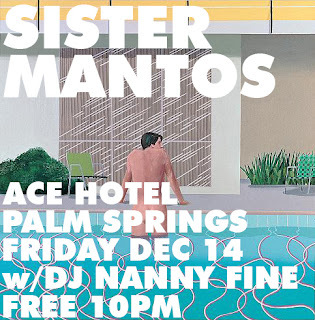 SISTER MANTOS: DEC 14th @ ACE HOTEL PALM SPRINGS!!! DEC 14th @ ACE HOTEL PALM SPRINGS!!! SISTER MANTOS plays a FREE, POOL SIDE SHOW!!! If you've been to the ACE you know it is a lovely pace to kick back relax and soak in the sun. There are discounts available on rooms. We'll post that info on the facebook event.